Vocabulary has always a tendency to lag behind technological progress - which is why we have a word for a merchant who deals in candles made out of sheep's intestines ("tallower" in case you are interested), but no word to adequately describe those people who use social media to tell you what they had for breakfast. One activity there really should be a word for is that of adding something unique to the World Wide Web. Obviously we are well past the stage where that is going to be something of great interest to humanity - such as an image of an undiscovered Van Gogh or a cute cat jumping up at a sewing basket - but even the most esoteric of things will be go interest to someone, either now or 500 years in the future. The internet provides us all with an opportunity of adding something to that monumental time capsule called documentary history. 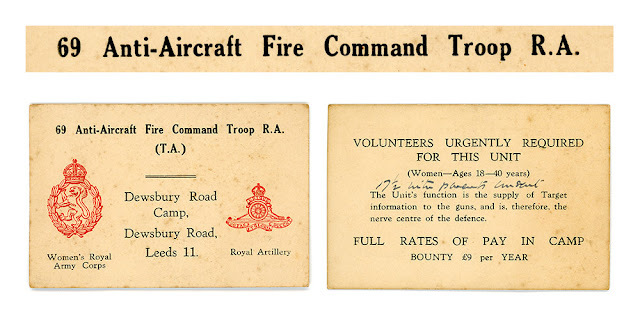 So whatever the word for the activity might be - I am doing it now with this scan of a small (9cm x 6cm) card which must date from the Second World War. 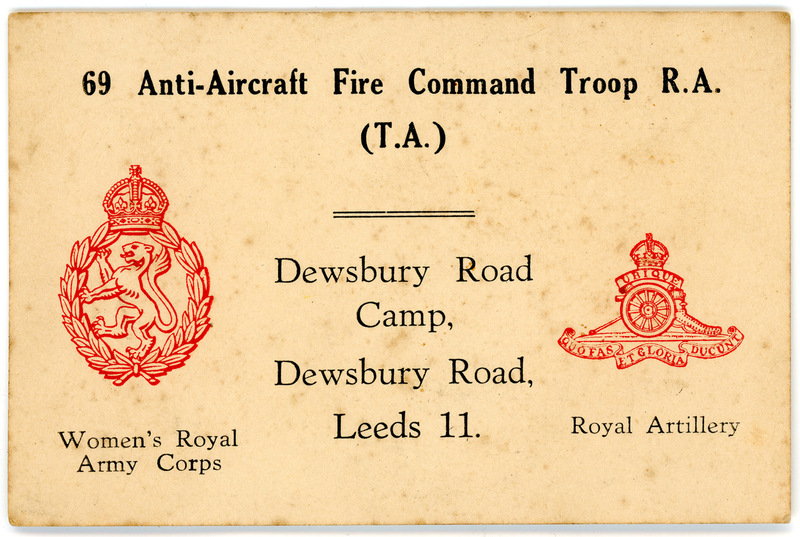 It is calling for women to volunteer for the 69th Anti-Aircraft Command Troop of the Royal Artillery, which had a camp on Dewsbury Road, Leeds. Women between the ages of 18 and 40 (seventeen and a half with parent's consent) were urgently needed to supply target information for anti-aircraft guns. 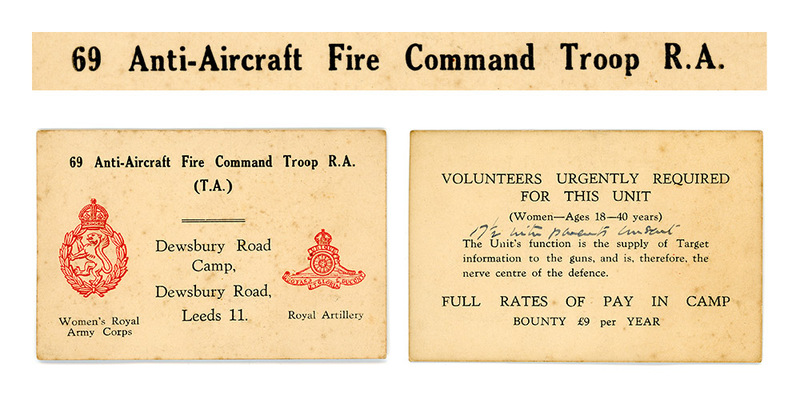 Not only was there full rates of pay in camp, there was also a bounty of £9 per year! 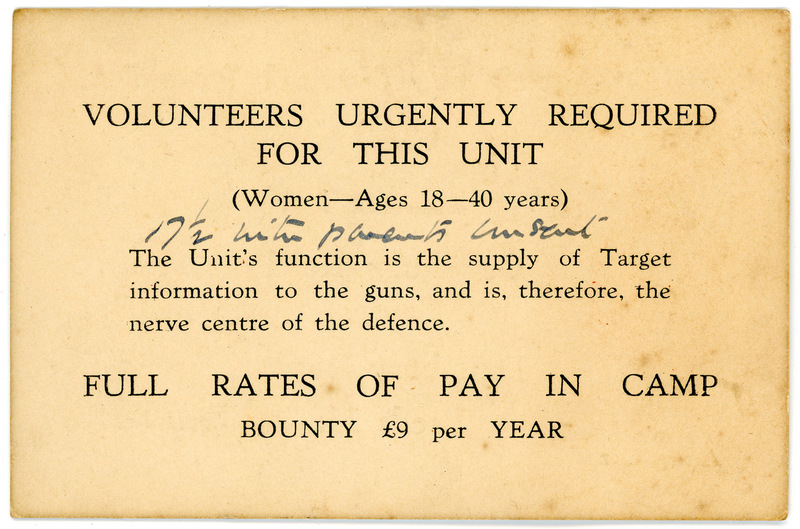 The card comes from the collection of my late Uncle Frank and Aunty Miriam, although there is no record of Aunty Miriam ever signing up. Perhaps the bounty wasn't attractive enough. I have carefully checked Google and as far as I can discover there are no other images of such cards - so this is my own personal contribution to documentary history, whatever that might be called. "Firstloading" - adding something unique to the World Wide Web. Won't let me post from JeffScape for some reason... gotta love technology.